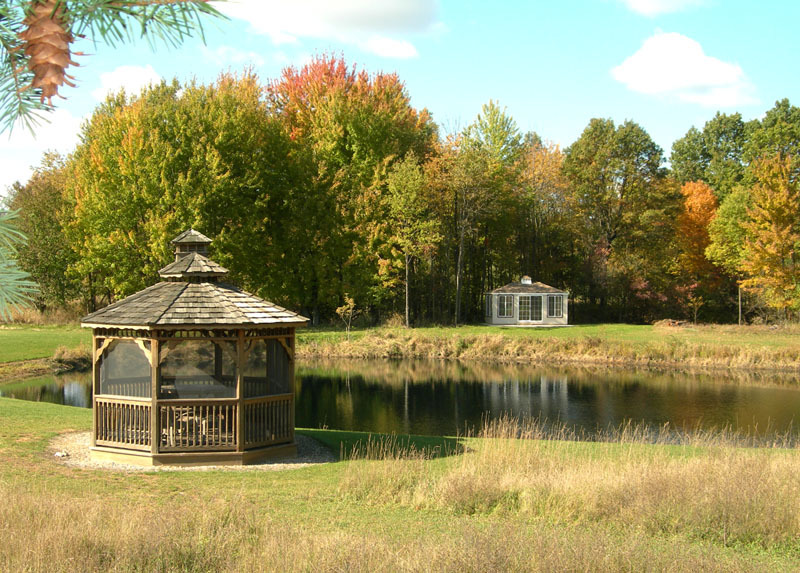 Overview of the pond showing the gazebo and the cabin, October 18, 2009. Years ago we often thought of owning land in northern Michigan with small cabin on it, as a nature retreat. We'd often canoed Michigan's northwoods rivers (Sturgeon, Pine, Au Sable, etc.) and done a lot of trail-riding up north too. We loved the area and thought it would be great to be able to enjoy time on our own land up there. On the other hand, we wondered how often we'd travel up north just to use a cabin, and the idea remained a quiet daydream. 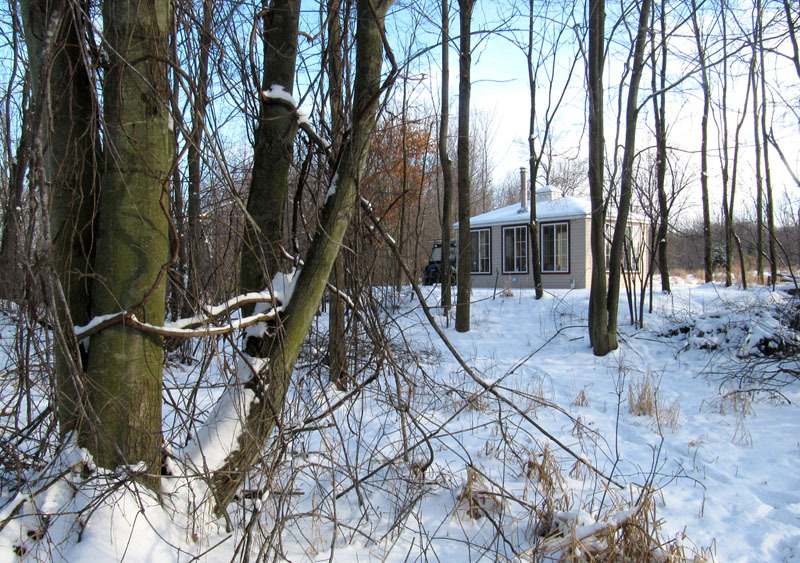 As we began improving the woodland and wildlife habitat on our land in southern Michigan, we got another idea: What if we built a 'northwoods cabin' right on our own property? We could then use it all year round and as often as we wished! 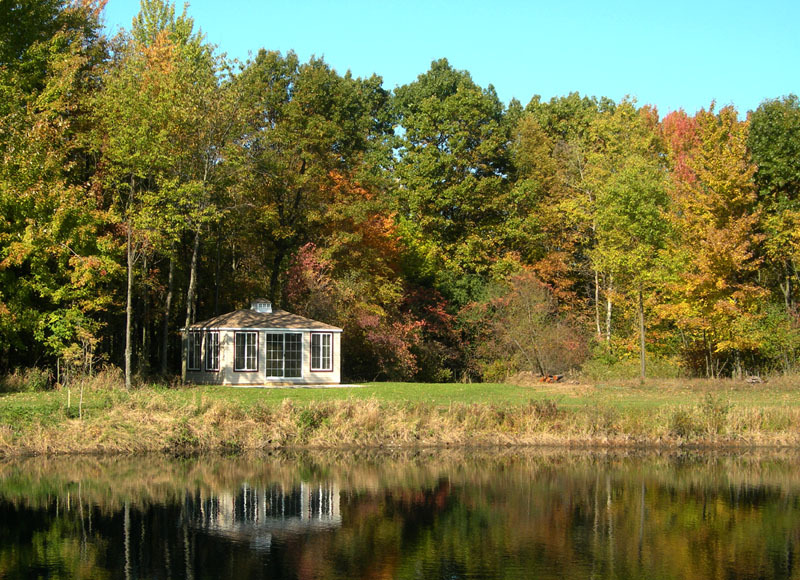 We've often used our screened gazebo as a summer retreat spot for reading and relaxing down by our pond, and had noticed an ideal location for a cabin diagonally across the pond in a sheltered clearing under a cluster of trees - a secluded area about 1/5 mile from our house. We'd gradually prepared the site by selectively clearing trees and leveling the ground, and began looking at various small log cabins and out-buildings to get ideas for what might work well there. 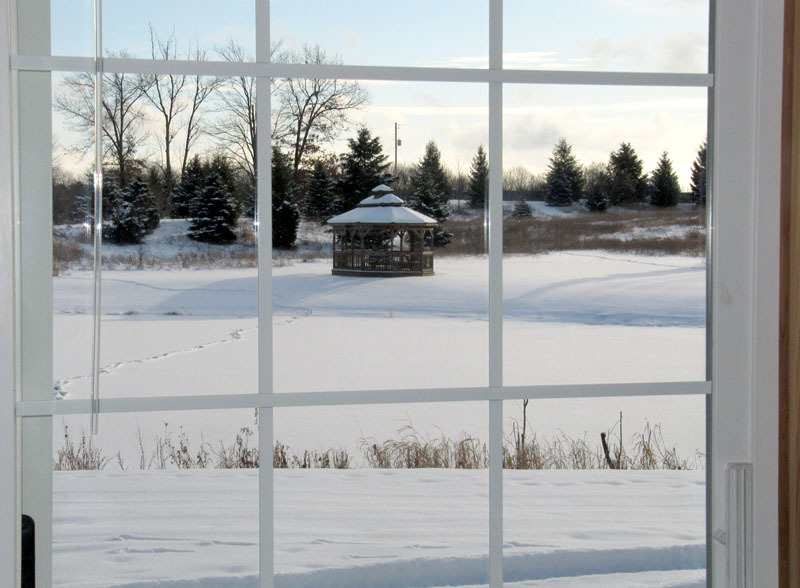 We found the perfect solution in 2009, on a visit to Jim's Amish Structures in St. John's Michigan where we'd bought our gazebo years before. 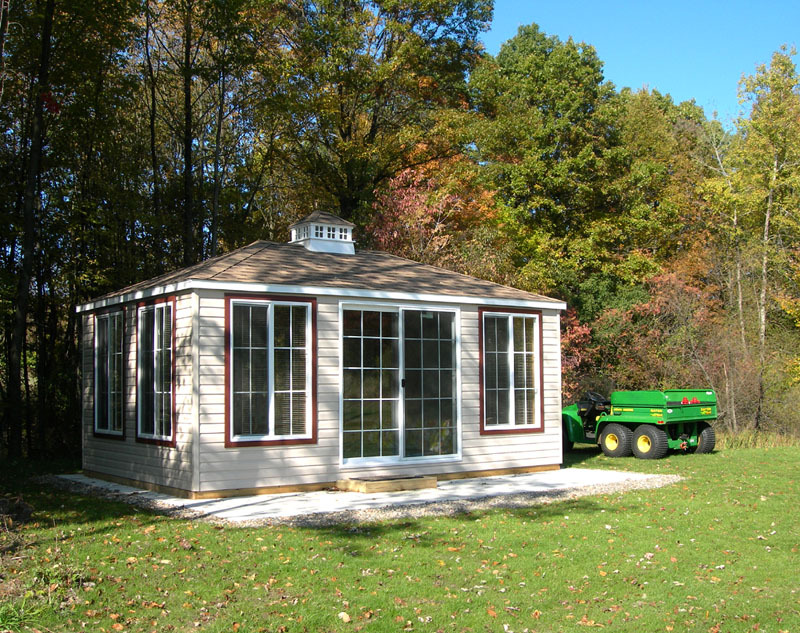 It's a new type of Amish-built "sunroom", a small wooden building that has tall horizontally-sliding screened windows for catching summer breezes, vinyl siding and excellent roofing for durability, double-pane windows and insulation for four-season use and is fully-finished inside. A final touch is antique elm vinyl flooring that looks very much like hardwood. 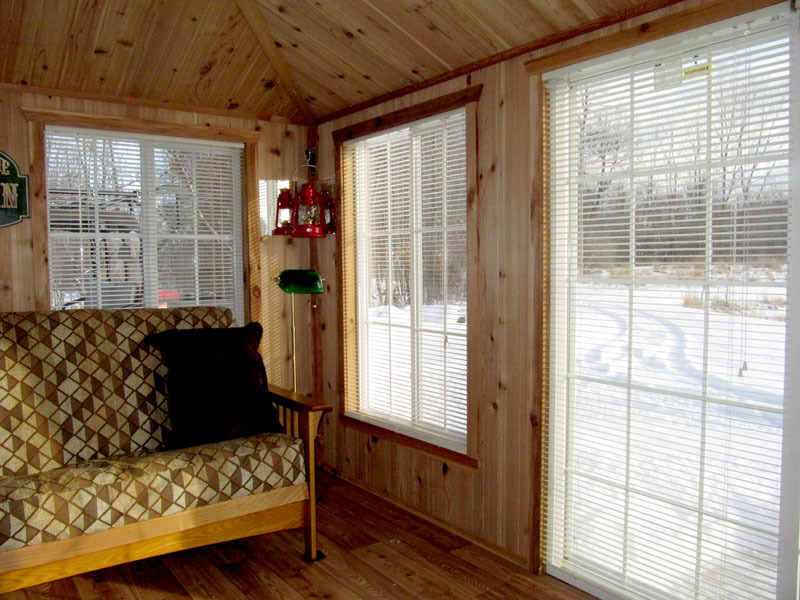 The most amazing part is that a 12'x18' cabin of this type is quite affordable, costing far less than a conventional sunroom. We ordered the building in August 2009, pulled a building permit and poured a concrete pad. 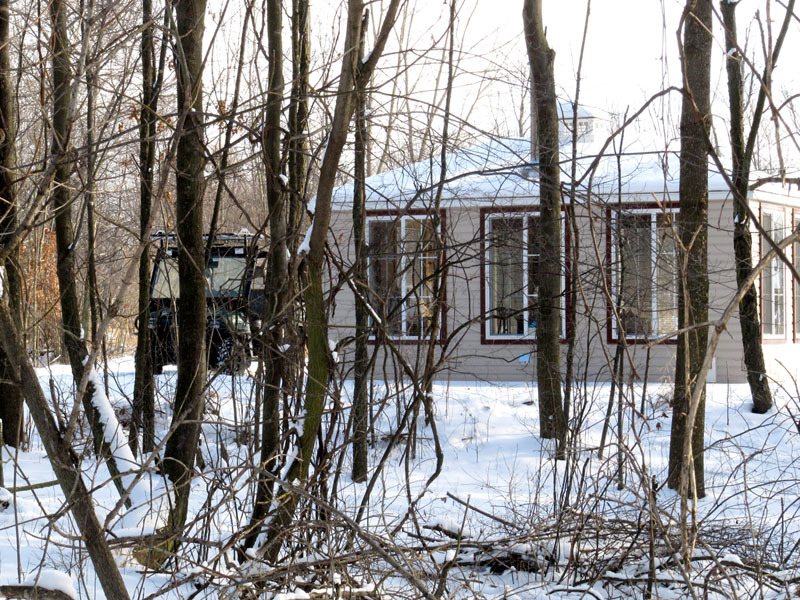 The cabin arrived fully constructed, and Jim's Amish used a special trailer with hydraulic maneuvering hardware to place it on the pad and rotate it into final position. We were even able to get grass planted and growing before the heavy fall frosts arrived. The photos below give an idea of what a wonderful retreat this little cabin has become. In summer, it will be shaded underneath a canopy of trees and with the tall windows opened the summer breezes will pass through up to head-height. On sunny days in winter after the leaves are down, the greenhouse effect warms the cabin by 20° or more above the outside temperature. Following are links regarding selected items in the cabin, to help others who'd like to create a similar retreat. A woodstove provides plenty of warmth on the coldest nights, and aluminum mini-blinds on the entrance door and all the windows provide a means to allow or block sunlight from entering – avoiding overheating in summer and helping retain heat inside on cold winter nights. The windows have 39" x 59" openings, and take inexpensive standard-sized blinds available at Home-Depot. We use Deitz kerosene lanterns for basic lighting (using Klean-Heat fuel), and a Coleman lantern if more light is needed. A small, quiet Honda generator is used when electricity is occasionally needed, such as when running a ceiling fan, laptop computer, small microwave oven, small radiant heater, electric blanket, electric lamps (with CFL bulbs) or other conveniences. However, most of the time we rely on basic 19th century technology for lighting and heating, and the nearby pond provides clean water. There's a reading area at one end of the cabin, with two comfortable chairs (more) and a small folding table that doubles as a dining area for two (using a Rhinolin top). A futon at the other end provides a nice place to relax, and doubles as a comfortable bed for two at night. A battery operated C.Crane AM/FM/shortwave radio (outstanding AM/FM reception) provides news and background music. We can comfortably hang out back here for days on end, at any time of the year. 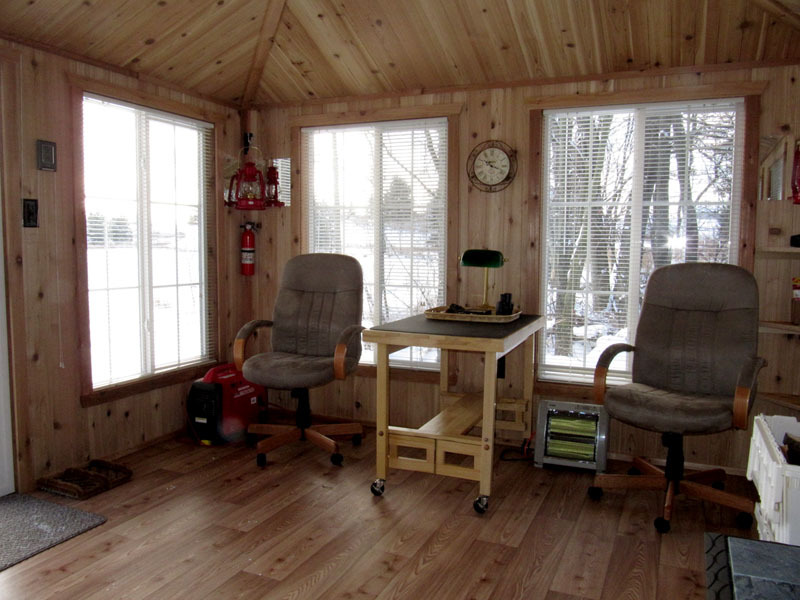 This little cabin is a perfect retreat for reading, studying, writing and just plain relaxing. With binoculars handy, we're always ready to observe wildlife action. With a 360° view out it's many windows, it's a perfect spot for connecting with and enjoying the beauty of our 'wild woodland garden' as the seasons go by. To get a further feeling for our woodland garden, see these landscape photos and wildlife photos, and especially these photos from a winter's day walk. Books that capture the spirit of such retreat-landscapes are Noah's Garden: Restoring the Ecology of Our Own Back Yards by Sara Stein, Native Trees for North American Landscapes by Guy Sternberg (more), and The American Woodland Garden: Capturing the Spirit of the Deciduous Forest by Rick Darke (more). I highly recommend them to you. We completed installing the cabin and got grass planted just in time before heavy frosts began. 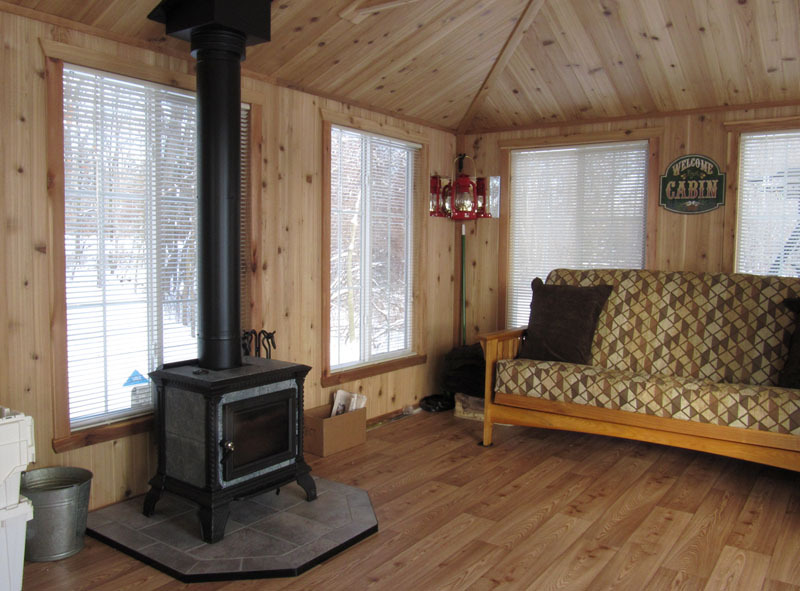 As winter began we worked on furnishing the cabin and installing a wood stove. warming it up nicely due to the greenhouse effect. 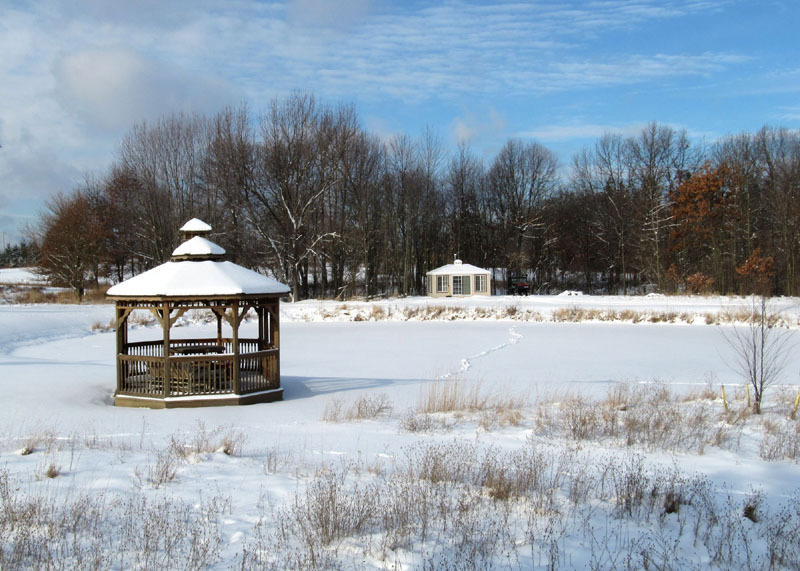 Looking out towards the pond on a beautiful winter day, January 9, 2010. The cabin is a wonderful retreat for reading books and working on writing projects. The reading area also serves as dining area for two, and a comfortable place to relax and observe wildlife. 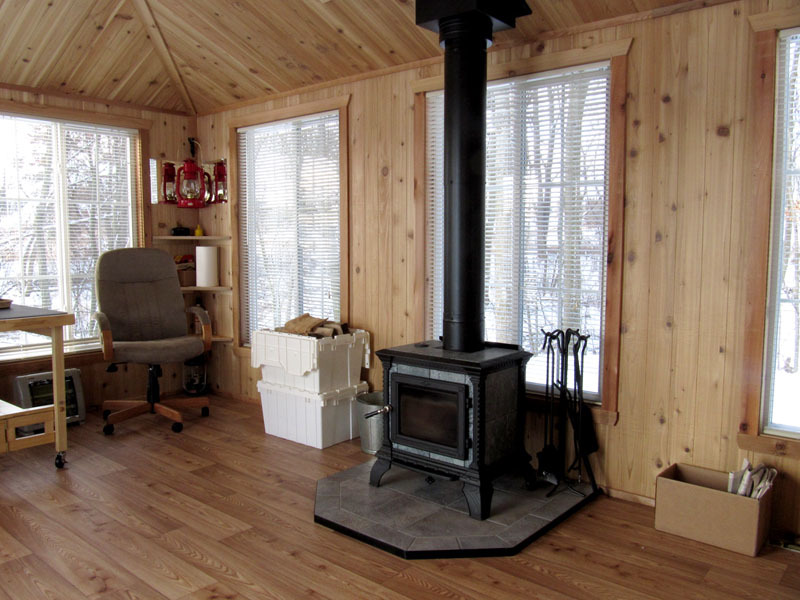 A soapstone woodstove provides plenty of warmth in winter, making this a full four-season cabin. The low-clearance installation keeps it close to the wall, avoiding taking up floor space. 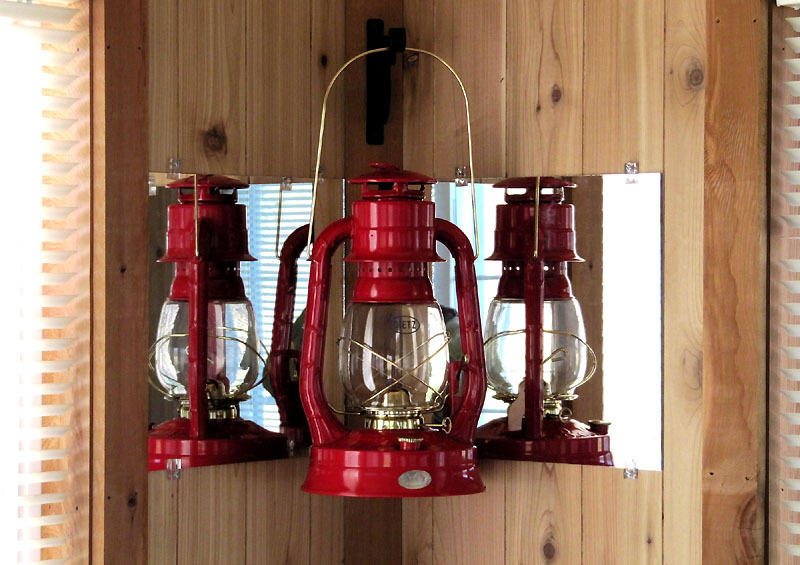 Deitz kerosene lanterns mounted in the four corners of the cabin provide easy-to-use lighting. The 12'x12" mirrors behind each lantern significantly increase their efficiency. A futon at the other end of the cabin provides a nice place to lounge, read and observe wildlife. Quickly convertible into a queen-size bed, it's a very cozy place to sleep. 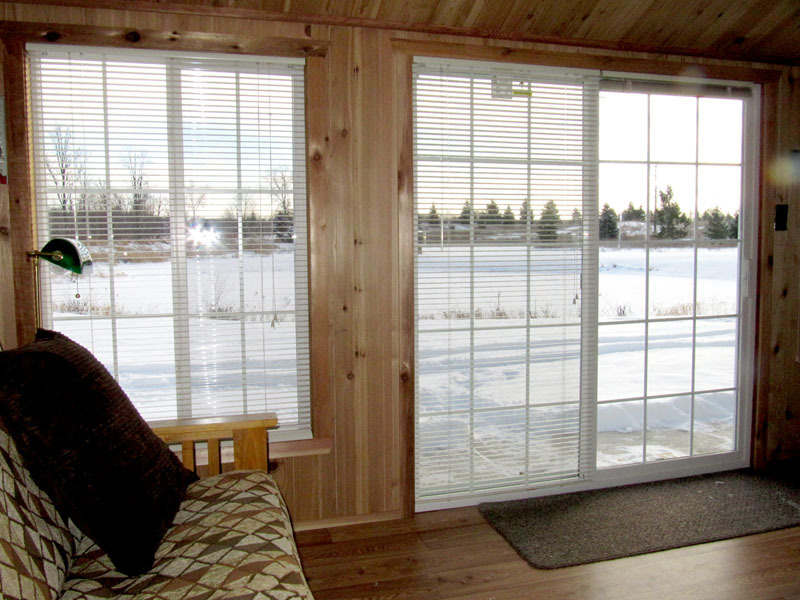 The cabin's many tall windows provide a 360° view of the surrounding woods, marshes and pond. 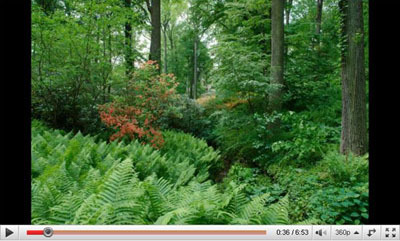 This is a great place for observing wildlife and connecting with our 'woodland garden'. Looking out the front door across the pond to the gazebo. 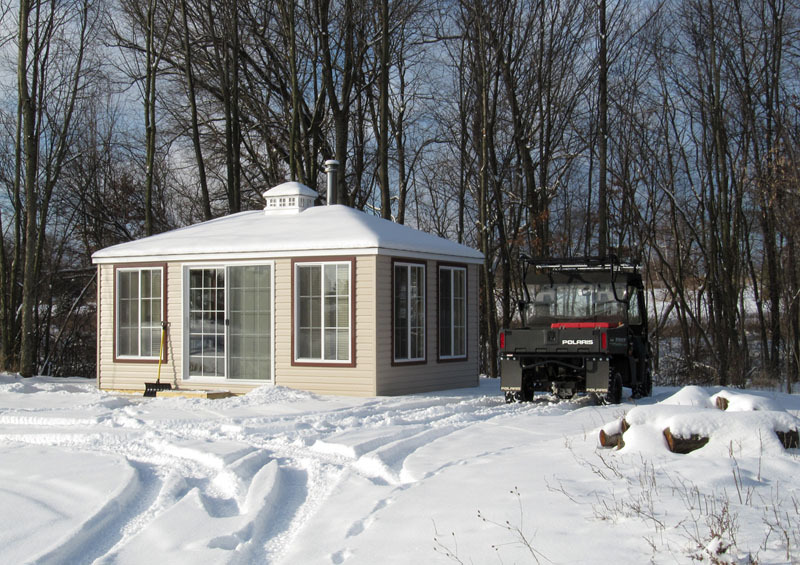 A winter day at the cabin, with our Polaris Ranger parked outside. Another look at how the cabin provides a 360° view of the surrounding area. 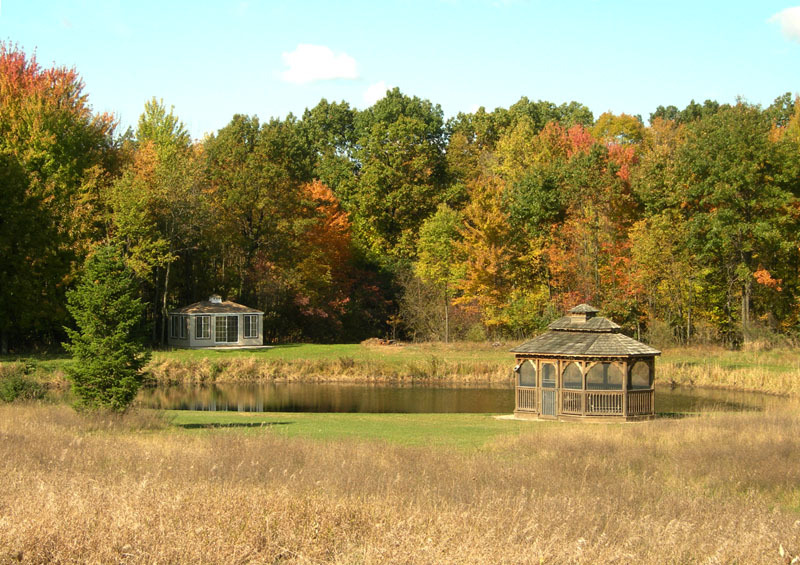 Another view of the gazebo and the cabin across the pond, October 2009.